Just when it looked like Stanford had figured out the Longhorns, all Hell broke loose. After trailing by about 6-10 points the whole game, Stanford made a 2nd Half run, by aggressively utilizing their star, Brook Lopez. They cut it to 52-51, but then the HOUSTON crowd woke up. The partisan mob spurred a 20-3 charge where the Horns just kicked everything up a notch — like a spicy Texas Chili recipe — and the Trees went down in the Land of Bush, 82-62. Now, regardless of what happens today in Phoenix, UCLA gets the distinction of being the Last Team Standing from the Pac-10 in 2008. Of course, it might be a hollow distinction, if the difference is only one day and one Round. Texas Guard D.J. Augustin led the Cavalry Charge and controlled the tempo, scoring a team-high 23 Points, as the Horns pulled away cleanly, like the meat off a Dr. Hogly-Wogly Tyler, Texas BBQ Spare Rib. 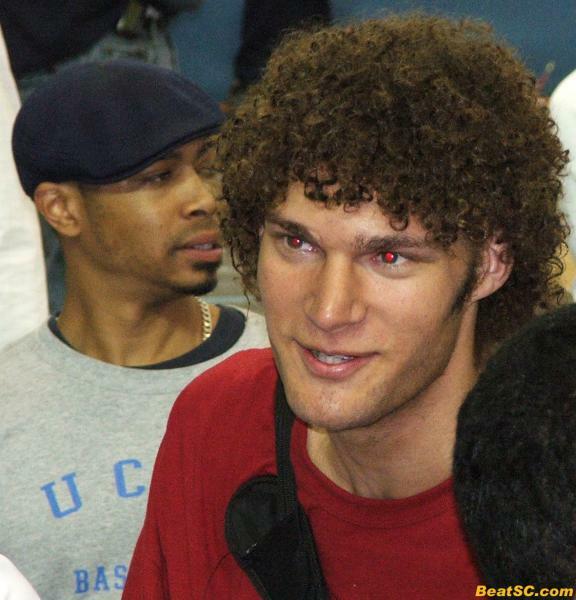 But don’t rib Brook Lopez, who scored 26 with 10 Rebounds, in his last game as a Sophomore. He is ready for the Pro’s right now, so it might have been his last game PERIOD, in a Cardinal uniform. His brother Robin, however, might not be ready, and might deserve a little blame. He scored only 6 Points on 3-of-9 shooting, and picked up twice as many Personal Fouls as he did Defensive Rebounds (4-to-2). But there is plenty of blame to go around, especially in the Shooting Department: Former Bruin-Killer Anthony Goods went 0-for-7 from the Field and got Shut Out, and Mitch Johnson went 2-for-10. Maybe Head Coach Trent Johnson should have gotten himself ejected from this game, too. 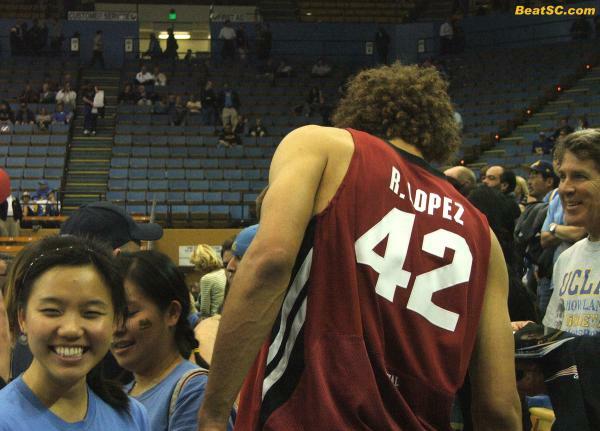 Are you going to miss all the TV close-ups of the Lopez Twins’ Mother in the crowd? Neither are we. So instead of a team that the Bruins have beaten three times staying alive, a team that beat UCLA in Pauley Pavilion does. But as any die-hard Bruin or Billy Packer will tell you, Darren Collison was not 100% in that game, so if Texas makes it past Memphis and the Bruins “survive” Xavier, UCLA will not be intimidated. However, they will not be complacent either, and that is a good thing. Now, back, by popular demand (one guy), is one of those pictorials you guys used to like so much. We start with a little “FAREWELL Tribute” (hopefully) to the Twins, and follow that up with some never-before-shared (mouse-over captioned) photos that required a little Photoshopping for red-eye reduction, bogey-removal and bad spacing, but still just might win UCLA a Texas Hold-‘Em jackpot. "TEXAS ELECTRIFIES, FENCES LOPEZES OUT, 82-62" was published on March 29th, 2008 and is listed in Non-Rivalry News, UCLA/usc/Cheerleader Photos, UCLA/usc/Sports Photos. 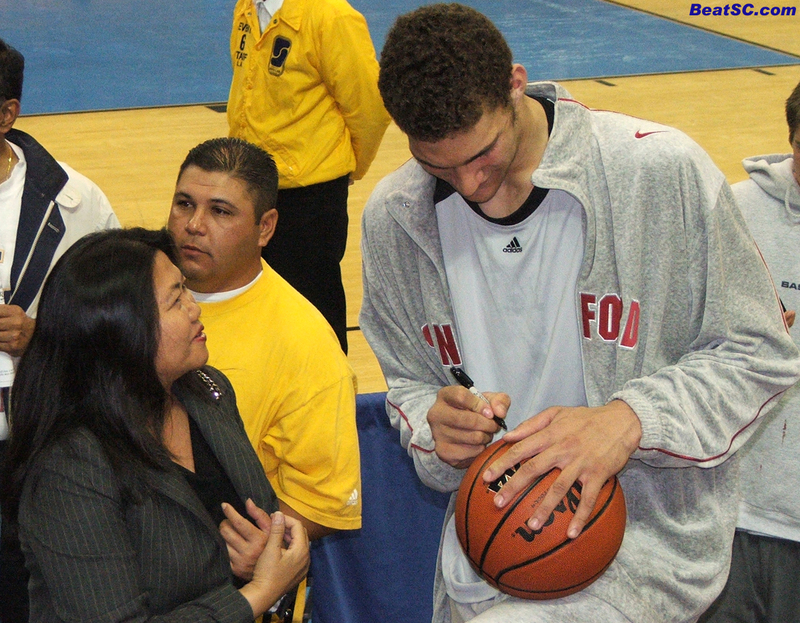 I don’t want to put anyone of our player’s on blast, so I won’t mention names…but when I was shooting the shi!t with one of the guy’s on the team and mentinoed that the Lopez twins’ mom looked like a female version of Frankenstien…he just laughed and said “I know”. You have inspired me to take up photography, drop 20 pounds,move to Southern California . buy the best of season tickets to get closer to the floor and the field and become a better human being! Your website and shots of the Bruin Babes spur me to personal greatness! God Bless you. And , as all the blogs are saying: God is a Bruin!